Many vulnerable children and young people who have lost parental care are supported by Namibia's SOS Children's Villages. Our organisation helps them to grow up in a caring family environment. Since the war in neighbouring Angola caused mass-immigration into Namibia, the presence of our organisation in Namibia has become even more necessary. The Republic of Namibia is a large and sparsely populated country in South-West Africa. The total population of Namibia is approximately 2 million and its capital city is Windhoek, home to 340,000. In 1990, Namibia became an independent nation. Since then, it has enjoyed relative stability. Namibia is a middle-income country with a market economy that is driven by the following sectors: agriculture, mining, fishing and tourism. Malnourishment, particularly among children, remains a persistent problem: 20 per cent of the Namibian population lack access to food and are chronically undernourished. Malnutrition is directly responsible for the death of at least 6,000 children annually. Frequent droughts and floods aggravate the situation, especially in extremely arid, rural areas of the country. Furthermore, Namibia is marked by a very high number of HIV/AIDS infections. At 13 per cent, the HIV prevalence rate is one of the highest in the entire world. Apart from the social implications of HIV, the disease is becoming an economic problem too: the most productive age group (25-44 years) also accounts for the highest number of HIV infections. Although the government of Namibia has made the fight against AIDS a national priority, 6,700 people die every year due to the disease. However, AIDS is not the only health risk that affects Namibians: other common diseases in Namibia include hepatitis A, typhoid fever and malaria. Although access to potable water is generally good in urban areas, Namibians who live in rural parts of the country often experience fluctuating levels of water supply. Like in most other Sub-Saharan countries, poverty is a problem in Namibia: more than 39 per cent of the population are considered poor by UN standards. The total school enrolment ratio for Namibia is roughly 89 per cent. Demographically speaking, Namibia is a very young country: nearly 35 per cent of the country's population is under 14 years of age. This figure can partly be attributed to the fact that Namibia has a comparatively low life expectancy. The current estimate is that Namibia is home to around 140,000 orphans. 70,000 of them have been orphaned because of AIDS. Children who lose their parents due to HIV often lack a caring family environment. In many cases, their most basic needs are not met and they are vulnerable to commercial sexual exploitation and forced labour in the streets of Namibia's cities. 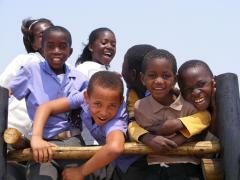 In Namibia, there are many street children. During the day, they beg for money and food or they do small jobs in order to survive. Many of them sleep in little shacks, in river beds or under bridges. Female headed households account for nearly half of the overall number of households in the country, primarily owing to the low life expectancy of males and labour migration. The income situation in female-headed families is often precarious. In fact, they account for the highest share of poor households in the country. It is evident that young children who grow up within these families are more likely to be disadvantaged throughout childhood than other children who grow up with both parents still alive. Young boys and girls are often in charge of putting food on the table for an entire family. Consequently, many of them do not attend school and there is not much time left for social or recreational activities. Hunger and starvation are serious problems that affect Namibia's youngest segment of population more than any other: the country is marked by nearly twice the normal percentage of moderately stunted children and three times that of severely stunted ones. In Namibia, the situation remains serious: the prevalence of undernourishment in children under the age of five is high at roughly 18 per cent. At 27 per cent, it is even higher among orphaned children and children who grow up without parental care. 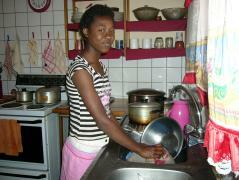 The number of children who grow up without parental care or are at the brink of losing it is on the rise in Namibia. They represent a serious development concern for the government of this African country. SOS Children's Villages is working with Namibian families in order to strengthen family ties and prevent children from ending up without parental care. The SOS Children's Village Association of Namibia was founded in 1984, the year when the first SOS Children's village in Windhoek went into operation. At present, the organisation is supporting Namibian children by providing day-care, education, medical assistance and other important services. Our organisation has also been running SOS Family Strengthening Programmes to support families who are at risk of abandoning their children. Children whose parents cannot take care of them can find a loving home in one of the SOS families.